Male and female gametes need to be physically brought together to facilitate fertilization. In most of the organisms, male gamete is motile and female gamete is stationary. In a few fungi and algae both types of gametes are motile. The male gamete needs a medium through which it can move to reach the female gamete. In many simple plants; like algae, bryophytes and pteridophytes; water serves as the medium through which gamete transfer takes place. But a large number of male gametes fail to reach the female gametes. To compensate for this loss of male gametes during transport; organisms produce male gametes in several thousand times the number of female gametes produced. In seed-bearing plants, pollen grains are the carriers of male gametes and eggs are present in the ovule. Hence, pollen grains need to be transferred to the stigma to facilitate fertilization. In bisexual plants which show self-pollination, anthers and stigma are close to each other. Hence, transfer of pollen grains to the stigma is relatively easy in these plants. But in cross pollinating plants, pollen grains need the help of some agent of pollination to be transferred to the stigma. It is important to note that cross-pollinating plants can be monocious as well as dioecious. Once pollen grains reach the stigma, they germinate to produce pollen tubes. Male gamete is then transferred to the ovule via pollen tube and ends up fertilizing the female gamete. In dioecious animals; male and female gametes are formed in different individuals. Hence, such organisms need to evolve a special mechanism for gamete transfer. Fertilization is the most critical event in sexual reproduction, and successful transfer of gametes is necessary for this event to materialize. Fusion of nuclei of male and female gametes is called syngamy or fertilization. 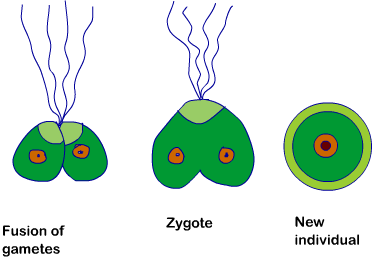 Fertilization results in the formation of a diploid zygote. Parthenogenesis: The female gamete in some organisms develops to form a new organism without fertilization. This phenomenon is called parthenogenesis, e.g. some lizards, rotifers, honeybees and some birds (turkey). External Fertilisation: In most of the aquatic organisms, fertilization occurs in external medium (water), i.e. outside the body of the organism. When fertilization occurs outside the body of the organism, it is called external fertilization. Organisms which exhibit external fertilization show great synchrony between the sexes while releasing a large number of gametes in water. Release of a large number of gametes in the external medium enhances the chances of syngamy. As a result, a large number of offspring are produced. But such offspring are extremely vulnerable to predators, and majority of them do not survive up to adulthood. Internal Fertilisation: In most of the terrestrial organisms; fertilization occurs inside the body of the organism. This type of fertilization is called internal fertilization. Example: some fungi, reptiles, birds, mammals, bryophytes, pteridophytes, gymnosperms and angiosperms. In organisms which exhibit internal fertilization, number of sperms is very large but there is significant reduction in number of eggs produced. Post-fertilisation Events: These events take place after the formation of zygote. Further development of the zygote depends on the type of life cycle of the organism and the environment it is exposed to. In fungi and algae, zygote develops a thick wall which is resistant to dessication and damage. It undergoes a period of rest before germination. In organisms with haplontic life cycle, zygote undergoes meiosis to form haploid spores. The spores then grow into haploid individuals. The process of development of embryo from the zygote is called embryogenesis. During this process, zygote undergoes mitosis and cell differentiation. Cell divisions increase the number of cells in the developing embryo. Cell differentiation results in formation of different types of tissues and organs which eventually results in formation of an organism. Oviparous Animals: When embryo develops inside egg but outside the body of the organism, the organism is called oviparous animal. In this case, the fertilized egg is covered by hard calcareous shell and is laid in a safe place in the environment. The egg undergoes a period of incubation. Young ones hatch out from eggs after the incubation period. Viviparous Animals: When embryo develops inside the body of the organism, the organism is called viviparous animal. In this case, the embryo develops into a young one inside the female organism. After attaining a certain stage of growth, the young ones are delivered out of the body of the female organism. Most of the mammals are viviparous animals. Vivipary ensures better chances of survival.